Let’s Discuss Dishcloths And Sit Back And Watch As I Slowly Turn Into My Grandmother. I recently read Ellen Sandbeck’s book Organic Housekeeping. It is seriously the best book I’ve ever read regarding cleaning, well, the only book I’ve ever read on cleaning, but it was a total eye opener. I have switched our cleaning supplies to vinegar, baking soda, and vodka (for cleaning, I swear, mostly) and I am now using dishcloths. 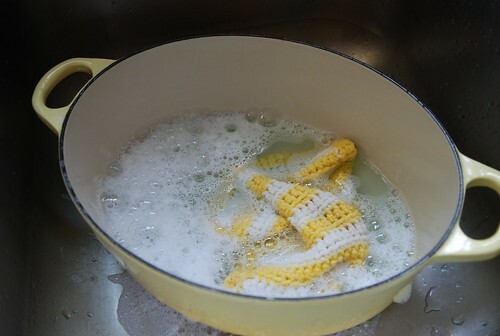 After washing the nightly dishes, I let the dishcloth dry overnight. It actually dries out quicker than overnight, hooray for 7,000 feet elevation. I can usually get a few days use before it gets tossed in the wash with the dishtowels. Fun fact: Your kitchen sponge can harbor millions of bacteria because it never dries out in between uses. I’m not saying a dishcloth doesn’t have bacteria, but by washing and drying it I feel that maybe it has less. Some folks microwave their sponges or toss them in the dishwasher, but the inside of a sponge must reach boiling temperature to kill any bacteria. Your sponge will probably burst into flames in the microwave and your dishwasher probably doesn’t produce enough heat and the drying cycle won’t fully dry it out. 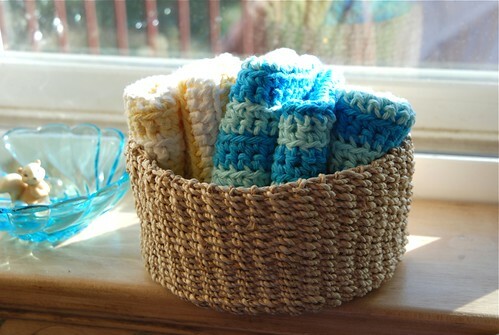 I purchased our handmade dishcloths from Wrens Nest Creations, they’ve held up very well. You can enter COLORADO20 for 20% off your purchase. I don’t like housework, but shopping on Etsy for supplies seems to motivate me. Do any of you use dishcloths?